1. If late-season flea beetles are 100% crucifer species, does that mean they’ll be mostly crucifer next year? Not likely. Several researchers have found that P. striolata (striped flea beetles) numbers are usually higher in the spring than in the fall, while the reverse is more often the case for P. cruciferae — the most common all-black species. AAFC Saskatoon entomologist Julie Soroka says she is seeing higher numbers of P. striolata in the fall than she used to, she says P. cruciferae is still usually the dominant fall species. 2. 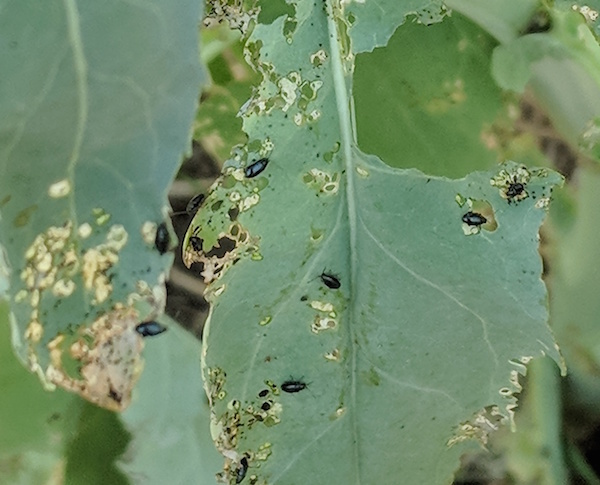 If these late season flea beetles overwinter as adults and start feeding on canola seedlings next spring, would it be worthwhile to spray them now to reduce the spring population? High fall numbers and suitable spring weather conditions are critical factors in determining how big a problem flea beetles will be next year. Fall spraying of flea beetles might reduce flea beetle numbers in a locality, but could also kill many beneficial insects. And migration from surrounding areas next spring could negate the flea beetle reduction this fall, while making matters worse by decreasing the impact of beneficial insects next spring. Plus the seed treatment you’ll be using next spring might be enough protection.